← 10 Haunting Melodies of S Janaki!! Composers of Voice – S Janaki and Music Directors!! This article is a brief analysis of Music directors who composed golden melodies in vocals of S Janaki. She sang for many of the from her first composer Pendyala to “Kolaveri boy” Anirudh. Starting the list with around 200 music directors . Will be adding more in future. Dubbing movies were not considered for this analysis. Music director Pendyala introduced her to Telugu and Kannada cinema while she sang her first song in Malayalam to SN Ranganathan. She recorded her first Tamil song for T Chalapati Rao and was singing frequently to greats like Aswathama, M Venkataraju, SP Kodandapani, Master Venu during her initial days. She sang rarely to Legendary composers like Pendyala, S Rajeswara Rao, S M Subbiah Naidu, S Dakshinamurty, Devarajan, P Adinarayana Rao, T Chalapati Rao etc.. but had memorable hits in their music. 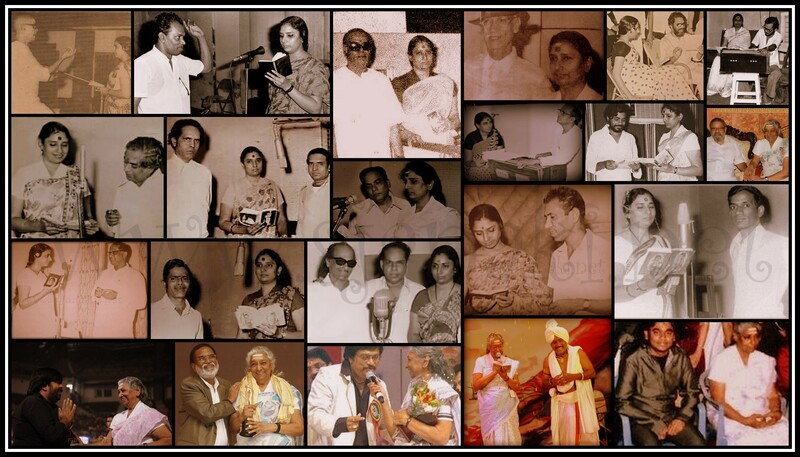 In Kannada cinema, G K Venkatesh established her as a versatile artist with his challenging compositions. Rajan Nagendra regularly composed melodies in her vocals. She also gave hits to Vijayabhaskar, M Rangarao, Upendra Kumar and others as well. Hamsalekha formed a hit pair with her during 90′s. In Tamil, it was Ilayaraja for whom she sang maximum number of songs. Without second thought, Ilayaraja experimented with her vocals in several goners of singing. It was a win-win combination that lasted for more than two decades. She recorded memorable melodies for M S Viswanathan as well. She gave hits to Shanker-Ganesh, Chandrabose etc..in 80′s and continued giving hits to A R Rahman, Vidyasagar, Deva, Sirpy and the likes in 90′s. In Telugu, She gave memorable hits in music direction of Ilayaraja, Satyam, K V Mahadevan, Chakravarty, Ramesh Naidu among other music directors. She continued her singing in direction of Raj-Koti, Vandemataram Srinivas, Madhavapeddi Suresh in next generation of music directors. In Odiya music, she recorded mostly for Akshaya Mohanty, Upendra Kumar and Prafulla kar. Lakshmikanth Pyrarelal and Bappilahri recorded Hindi songs frequently in her voice during 80′s. She also sang for composers like R D Burman, Raveendra Jain, Anu Malik & Anand-Milind. She sang for C Ramachandra, O P Nayyar, Lakshmikant Pyarelal, Bappi Lahri, Usha Khanna etc.. in their South Indian Projects. She sang in music direction of Singer turned music directors like Ghantasala, S P Balasubrahmaniam, K J Yesudas, Malaysia Vasudevan, P Leela, B Vasanta etc.. She herself composed music and sang for many private albums and for one Telugu movie “Mouna Poratam”. Likewise, She sang in music of Directors like T Rajendran, K Bhagyaraj & Singeetham Srinivas when they composed music for their movies. She sang for father-son composers like S Rajeswara Rao – Koti & Vasurao, RK Sekhar – A R Rahman, Ilayararaja – Karthik Raja & Yuvan Shanker Raja, Deva – Srikanth Deva, TV Raju – Raj and the likes. It was for Ilayaraja and Salil Chowdhury that she sang in Tamil, Telugu, Kannada, Malayalam and Hindi! Likewise, She rendered compositions of M S Viswanathan, K V Mahadevan, Rajan Nagendra in Telugu, Tamil, Kannada and Malayalam and for Bappi Lahri in Hindi, Telugu, Tamil and Kannada.In terms of number of songs and popular hits, it was Ilayaraja for whom she sang maximum number of songs. In Terms of longevity, it was for V Dakshinamurty of Malayalam cinema that she rendered her first song during late 50′s and last song in 2008. Below is list of music directors and one random pick from their compositions. Same songs are added in the playlist. Few songs are not available in Youtube and will be added in future! In addition to composers listed here, she worked with Bollywood composer Ravi, Malayalam music director Sarath, Telugu composers like Garimella Balakrishna Prasad, L Krishnan, S Vasu Rao, Gangadhar etc.. for her private albums.